Dennis is a formerly homeless Veteran who lives at Community HousingWorks’ affordable Avocado Court apartment community in Escondido. After getting injured during his time in the Navy, Dennis found himself struggling to get back on his feet and was homeless for over 12 years. 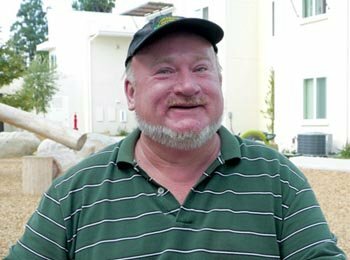 When Dennis heard about CHW’s new apartment community for homeless Veterans, he was hesitant at first to accept some outside help, but decided it was time. Today, Dennis is thriving in his new home, where he has found the encouragement to go to college and pursue his dreams. Dennis is also very involved in his community, tending to the Avocado Court community garden and working with other veteran neighbors.